Safety Smart is a global educational program designed to improve children's awareness and understanding of safety, health and environmental issues, and ultimately impact their behavior. They partnered with Disney to create a series of Safety Smart lessons, hosted by Timon and Pumbaa. The classic cartoon duo helps children understand abstract concepts like internet safety through these humorous situations. This episode educates children on the importance of protecting their personal information, how to be responsible digital citizens, and what to do if they are bullied. I designed the props and managed After Effects assets as an Animation Intern at DUCK Studios. The video is one of four episodes within the Wild About Safety with Timon & Pumbaa series. It has been translated to over 15 languages and is available on iTunes. 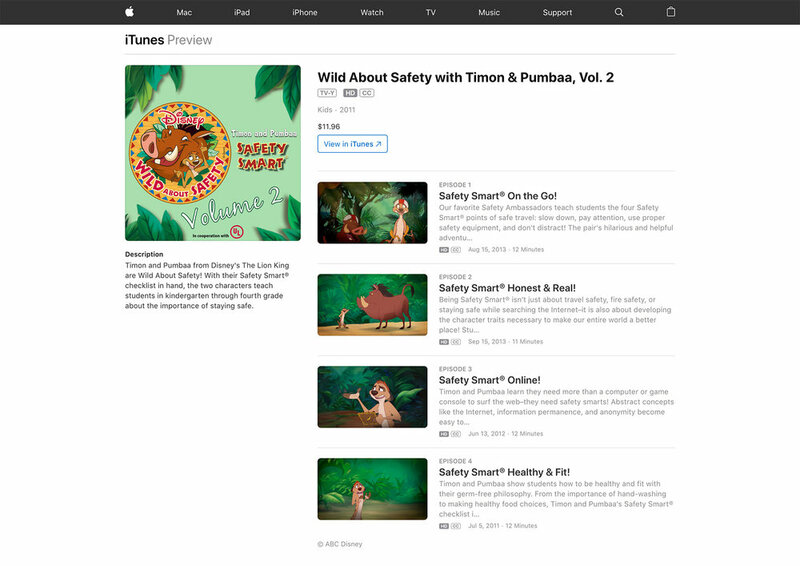 Wild About Safety with Timon & Pumbaa series on iTunes.